A spontaneous eBay purchase resulted in me acquiring a load of 6mm / 1/300th scale modern Warpac troops, only a few years after I carelessly sold all of mine not expecting there to ever be as playable a set of rules come along as Cold War Commander. However, buying more figures is never a hardship and this looked like a tempting deal with �26 for over 100 AFVs and a couple of incomplete Hind helicopters, so I bought on in again. The purchase and refurbishment of the Heroics and Ros Hinds prompted me to look for some plastic disks to use as rotor blades, as I had used something similar when I actually bought this lot the first time around - and a Google search threy up a new supplier called Hurlbat, based in the UK and apparently thinking about manufacturing exactly the things I was looking for. So, some very pleasant and efficient correspondance later and I had bought a couple of sets of rotor discs for the 2 Hinds in the army. They came like this, with holes drilled in the middle and covered in a scratch-resisting thin blue film on both sides - it was a little fiddly to remove, especially from the part of the disk that had been etched to create a rotor effect but the end result was really cool - as you will see later. This was the collection of tanks in the eBay photo - painted to a basic standard but by no means a finished proposition. My first move was to clean up the models - not much needed doing - and, as part of my ongoing campaign to cover every square inch of my wargaming collection with Army Painter Quickshade, give them all a brush-on coating of varnish and stain. The Heroics and Ros helos were missing their back wheels and rocket / missile stores, so I cut off the nose wheel, filled in the gap in the fuselage where the rear wheel assembly was supposed to fit with some woodfiller, and added some generic missile/rocket pods made with brass rod, painted black and drybrushed with GW Chainmail (can you tell I'm also an Ancients/Renaissance gamer?). then drybrushed with Coat d'arms Uniform Grey (525) and then the classic GW Bleached Bone. This shows the etching effect - which definately adds something extra to an otherwise blank disk. I really like it - thanks Hurlbat! About as close as one want's to get to a Hind! The helos had been varnished as well, but with almost no edges or indents for the stain to settle into the wash hadn't done much more than make them look a little dirty. The paint scheme I was trying for was based on this picture here. I may decide to paint the stand a darker colour - the light grey sounds like a good idea but does show up a bit too clearly on the tabletop. This is a shot of most of the armour in the army, post basing, varnishing and drybrushing. The tanks all look to be Skytrex T72's (I thought they might have been T80's originally) with 18 as the later version with smoke dispensers, and the 9 on the left as slightly earlier ones. The command stand has a spare T72 and a SA-9 mounted on a BRDM, as Command bases in CWC have organic AA capability. In the background an MTLB mounted SA-13, a ZSU and some BRDM scout and AT vehicles make up the set. Close up the drybrush of Bleached Bone is a bit strong, but at tabletop distances it really works. In CWC the command stands don't function as per their troop types, they are just representational - this is a 3x3 cm base (originally cut for PBI in 15mm!) I've used for a 2nd-level command unit. The newer Skytrex T74/80's all have extra fuel tanks on the back - I am 99% sure these are Skytrex, as they look the same as the ones I sold a few years ago! When drybrushing I found it difficult not to get some of the tank barrels a little over-covered - see the one at the left hand end of the middle row. Perhaps I should go back over them with some more olive at some point? These are the earlier model T72 - maybe even the elusive T64 ? This is a cluster munition's eye view of the Warpac tank unit ! This is the "main" command base, on a WRG-standard cavalry base of 40mm x 30mm. It has an MT-LBu large command vehicle (which you can also see here in real life) and may be a Heroics and Ros vehicle, as the model on the Skytrex site doesn't look to have this level of detail, and a BMP with ground surveillance radar plus a couple of infantry - who I suspect are actually WW2 Soviet artillery crew, but at this scale who's counting? See - can you tell ? These are BMP1's I think - the set of troops I bought contained 3 different types of BMP model, however I believe that these are BMP1's from Skytrex. At least the person I bought them from had largely resisted the temptation to do red noses on the Sagger AT missiles ! The downside of static grass is that bits of it do tend to get everywhere - some has drifted onto the middle BMP here. I always try very hard to brush it off once it has dried to the base, but some strands always seem to escape and get stuck to the figures or tanks. These are the early model tanks. I hoped for a while I could call them T-55's, as the 2nd-line non Soviet warpac armies in CWC lists do have T55s and T72's, but I can't convince myself they are anything other than T72/64's. This does means I will have to buy some more T-55's though, so not all is lost !! 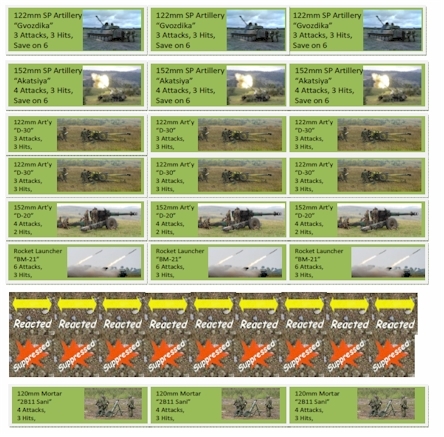 27 tanks and 9 BMPs, a full attack force of 3 batallions of tanks and a batallion of BMPs! These are a different type / make of BMP - I only got 6 of them, and I suspect they are BMP2's. They may be Heroics and Ros, although the fact the turrets are cast on may make then CinC ..? More of the rogue grass, on yet another type of BMP - this may be a BMP2 from Skytrex (code M747), but with an incorrectly mounted Spandrel missile which should really sit on top of the turret rather than at the front. This is the third and final shot to guess the maker and serial number! BRDM1 and Swatter missiles I suspect, based on a UK penny - cheaper than making or buying a base of the same size..
A cleaner casting, presumably a BRDM2 with Spandrel as there are 5 missiles, rather than the 4 in the Sagger variant. According to Wikipedia the BRDM-2 has unique flaw, in that the only way in and out of the vehicle is via the front hatches, so leaving the vehicle while in combat is almost impossible because the exiting crew members would instantly enter the line of fire of the enemy and even their own crewmates, as the hatches are positioned directly in front of the turret. The Poles fixed this... so if this army plays as Polish, the little guys in here will be very grateful ! Here is one hiding in it's own cover ! and from the other side as well. The eBay set also came with a couple of these odd soviet PTS Ferry amphibious vehicles.. (thanks Sgt Lone for the ID!) . This is the whole set, finished and based along with a handful of rescued infantry bases - no closeup as I don't want anyone spotting the WW2 German AT weapons clearly held by some of the chaps ! There are far too many BMP's really, and if I want to have them as a proper Polish army I do need to get some OT-64 and OT-65 wheeled IFV's too. You can also comment, "like" or give feedback on these pictures on either the Madaxeman.com Facebook Page or the Madaxeman.com Blogger Site. NEXUS 1/72 SCALE. APACHE CAMP - 66 PIECES - ATL015 Atlantic.. Boxed. Complete. 6mm Modern Africans wargame figures by Irregular Miniatures. Unpainted.